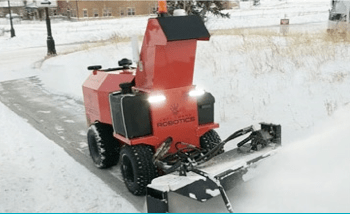 LONGMONT — Left Hand Robotics Inc. has raised $3.7 million that the company says will enable it to initiate production of its SnowBot Pro commercial self-driving snow-clearing robot. Left Hand Robotics Inc. Has raised $3.7 million to begin production of its SnowBot Pro snow-clearing robot. Courtesy Left Hand Robotics Inc. The seed-financing round was led by venture-capital firm Heroic Ventures, with other participants including Hardware Club, PV Ventures and Stout Street Capital. Left Hand says that a single SnowBot Pro can complete the work of 14 shovelers in the same amount of time. Commercial snow-management companies and municipalities can reduce their labor costs by up to 80 percent, the company says. The investment will enable Left Hand to expand its team and scale production, with delivery of SnowBot Pro to begin by late 2018. The robot costs $32,995, plus an annual software subscription. SnowBot Pro is GPS-conrolled and connected to the cloud and follows a pre-programmed path unassisted to clear sidewalks and bike paths. The system includes LIDAR and RADAR sensors that detect obstacles and allow SnowBot to drive itself safely. Onboard cameras automatically take before and after pictures included in post-action job reports, and monitoring systems allow an operator to monitor the SnowBot in real-time from the Web or a mobile device. SnowBot can pre-treat walks ahead of a storm and apply solid or liquid deicer immediately after clearing snow.